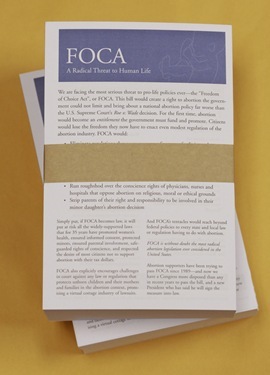 This weekend parishes throughout the archdiocese are participating in a postcard campaign to let our Federal elected officials know that we, as Catholics, strongly oppose the so-called “Freedom of Choice Act,” commonly known as FOCA. Already, 35 million postcards have been requested by the dioceses throughout the United States. This is probably the largest postcard campaign ever and it seems to already be having a good effect, but we don’t want to rest on our laurels. 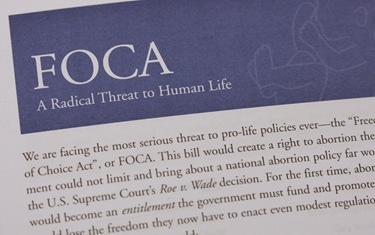 Although FOCA itself might be sidelined and not voted on as such in Congress, individual issues — conscience protections for health care workers and so forth — are very much at stake. Many of the unacceptable programs in FOCA could be tacked on to other kinds of legislation and we could, as the old saying goes, die the death of a thousand cuts. So, we are encouraging everyone to participate in this very important initiative of the entire Church. It is going very well and we would hope that in Boston our people will be very supportive in participating in this program. This year, the Men’s and Women’s Conferences will be held on the weekend after Easter, April 18-19, at Boston College’s Conte Forum — a wonderful location for it. These Conferences are one of the largest gatherings of Catholics in our Archdiocese. An outstanding program has been assembled. 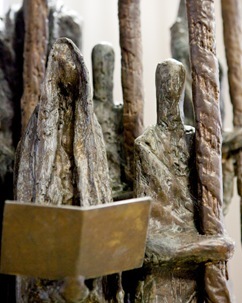 They offer a number of speakers, confessions, Adoration and time for Catholics to gather to discuss, deepen and renew their faith. This year’s keynote speakers at the Men’s Confernece are Jim Caviezel, Coach Jerry York, Jim Stenson and Curtis Martin. For the women’s conference, Jim Caviezel will be joined by his wife Kerri, and we’ll also hear from Johnnette Benkovic, Sr. Nancy Keller and Dr. Mary Healy. I will celebrate the closing Mass at each Conference. I encourage fathers and sons and mothers and daughters to come. Also, we would ask people to invite friends and neighbors and use this as an opportunity to evangelize and reach out to inactive Catholics — those who wouldn’t ordinarily have the opportunity to participate in something like this. We would ask everybody to make a special effort not just to be there but also to bring somebody with them. 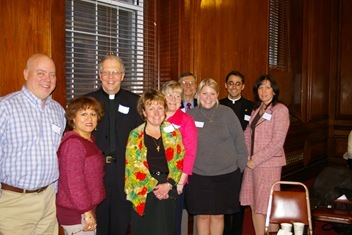 Last Friday, we met with the heads of the Catholic schools offices of New England. We talked about the future of Catholic education, its importance, some of the strategies to promote it and the possible plans for a future meeting with all the bishops in New England around the issue of Catholic schools. 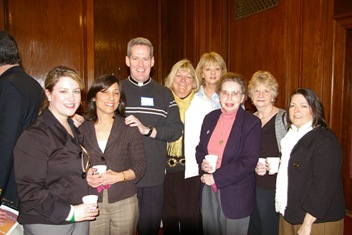 Later in the day, I attended the 2009 Co-Workers in the Vineyard Conference for laity at the Campion Renewal Center in Weston. This event was sponsored by the MAM program and the Office of Clergy Support and Ongoing Formation and co-sponsored by many of the Archdiocesan pastoral offices with support from Our Sunday Visitor, a Catholic publishing company. 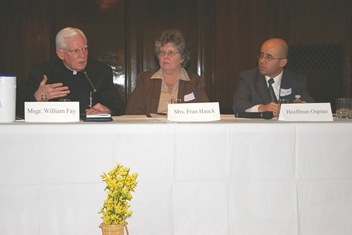 The conference was called “Hope for the Parish of the Future.” Monsignor Bill Fay and Father George Evans spoke on the issue of Pastoral Planning, along with Aldona Lingertat, the director of the MAM program. On Saturday, I went to Springfield for the Men’s Conference held at Cathedral High School. I gave a talk to the Hispanic men and then had the closing Mass. 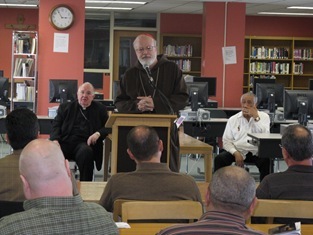 Father Gary Dailey, the vocations director for the Diocese of Springfield, ran the event and did a wonderful job. 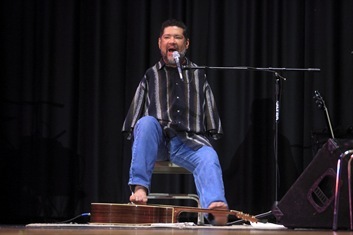 Tony Melendez, a renowned musician who was born without arms, performed at the event. Tony Melendez at a recent performance in Wilmington, Del. Over 800 men attended. They have been holding the conference for a couple of years and it has been very successful and well received. 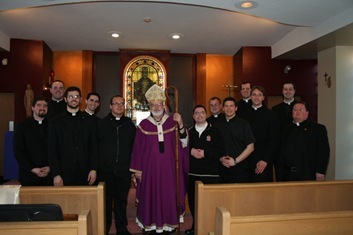 All of the Springfield Diocese’s seminarians were there, which was good to see. Many of them are studying at St. John’s. 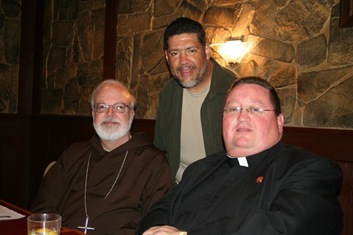 We had dinner with them and Tony Melendez afterwards at a nice Italian restaurant in the area. It was a big gang of us! 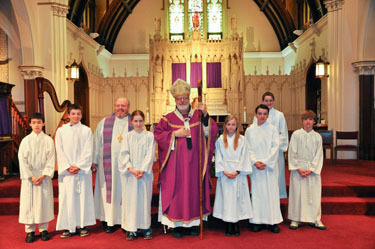 The next morning, I went to St. Mary’s in Brookline for the confirmations of the children of the St. Lawrence and St. Mary’s communities. 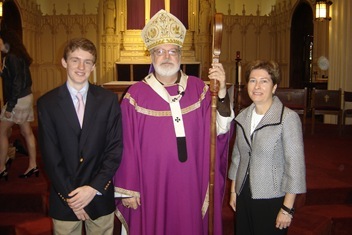 Not that many people know that Father Ahern is an archimandrite, which is a title almost equivalent to Monsignor that is given in Eastern rite Churches and it was granted to him by an Eastern Rite Bishop. On Sunday evening, I flew down to Washington for meetings at the Bishops’ Conference. We had a meeting of the Clergy, Consecrated Life and Vocations Committee in the morning and in the afternoon, the Pro-Life Committee. The following day we had the Administrative Board meeting, which meets prior to our spring session to plan our agenda and to deal with business that has come up in the meantime. At the meeting a very positive report was presented on the FOCA campaign that I mentioned above. I was very pleased to see that FOCA has been having a very good effect already and that Catholics across the country are gravitating toward this effort. 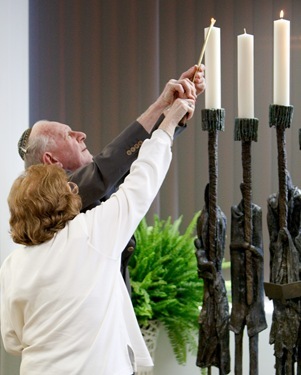 Wednesday, we had the re-dedication of our Holocaust memorial Yom HaShoah Menorah, here at the Pastoral Center. 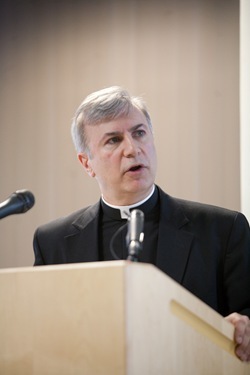 After the controversy concerning the Lefebvrite Bishop Williamson, I met with survivors of the Holocaust and leaders of the Jewish community in Boston to reassure them of the Church’s commitment to the teachings of “Nostra Aetate,” the document of the Second Vatican Council concerning our relationship with the Jewish people. At that meeting I announced that I was going to take this occasion to transfer the Holocaust menorah from our former Brighton property and bring it to our new headquarters. I asked them to participate in the event and they seemed very pleased to be a part of it. 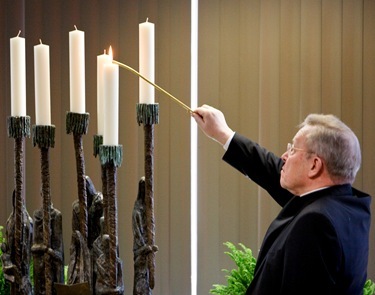 It worked out beautifully because the next day I found out that Cardinal Kasper, the Holy Father’s representative to the Jewish people, was going to be in the country and I called him to invite him to come and be a part of the ceremony and he graciously accepted. 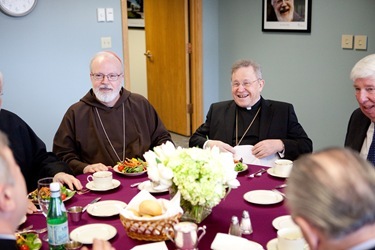 Father David Michael worked very hard with Father Ed O’Flaherty and Vito Nicastro, all from our Interreligious Affairs Office, on the event preparation. We had the celebration here on the Feast of the Annunciation. 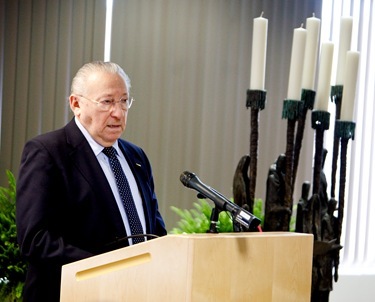 We began with a luncheon to which we invited the rabbis, different leaders of the Jewish community, Holocaust survivors and some members of the Catholic community. 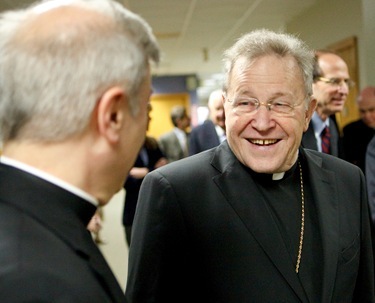 At the luncheon, we had an opportunity for an informal discussion — questions and answers directed to Cardinal Kasper. Many of the questions were very direct and difficult and the Cardinal answered them with great serenity and honesty. 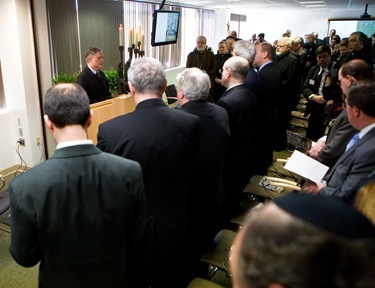 After the lunch, we gathered in the large conference room for the dedication service. Father David Michael was the emcee. 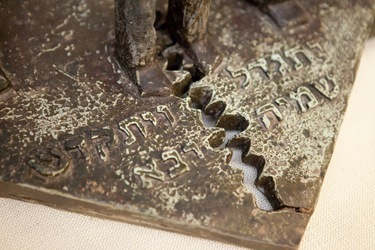 The Menorah was placed in the center of the room there. 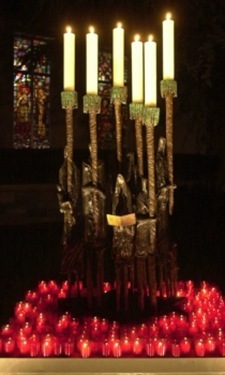 It is a beautiful artistic piece that shows six men and women holding torches to represent the six million Jews who died in the Holocaust. It was originally placed on the old chancery grounds in 2002 as a generous gift from the late Lenny Florence and his wife Charlotte. 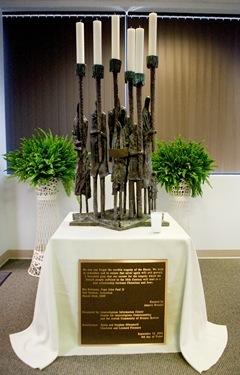 The 2002 dedication was in the presence of many of the same leaders of the Jewish community that gathered for the rededication. At the ceremony, I gave a short presentation in which I quoted the Holy Father from his meeting last month with the American Jewish leaders in Rome. I introduced Israel Arbeiter, the president of the American Association of Jewish Holocaust Survivors of Greater Boston, who addressed us and talked about his experience of the camps and the horrors of losing his loved ones. Then Cardinal Kasper spoke and we had a dedication prayer that included Cardinal Kasper reciting the prayer that Pope John Paul II inserted into the Wailing Wall at the Temple of Jerusalem in the Jubille Year of 2000. Then, Cantor Aryeh Finklestein sang the “El Maleh Rachamim.” He was the same cantor that sung at the ceremony in 2002. It was very beautiful and very moving. We concluded with members of the Catholic and Jewish community, including Holocaust survivors, Cardinal Kasper and myself lighting the various candles of the menorah. 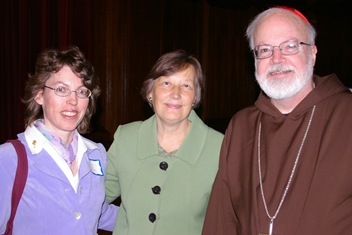 That evening I went to the Redemptoris Mater House of Formation in Brookline where they had invited me for dinner to celebrate the third anniversary of my being named a cardinal. After the meal we sang a lot of Spanish and Portuguese songs. 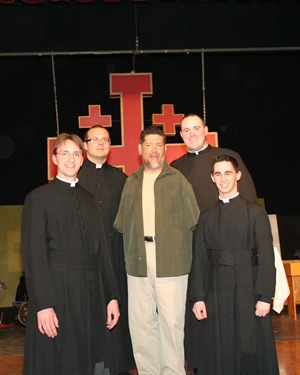 It was a lovely evening and I was grateful for the hospitality of Father Tony Medeiros, the rector, and the seminarians. 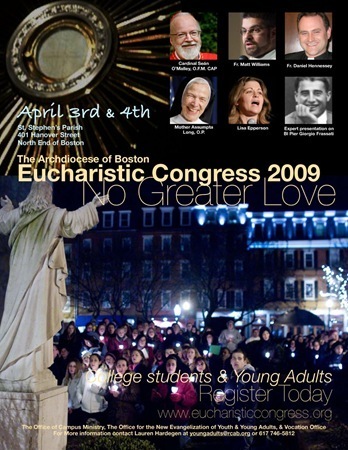 Before I end, I want to remind you of the Eucharistic Congress that will take place in the North End April 2 and 3. If you haven’t yet, please visit their web site for more information. I hope to see you there.